User experience was the huge theme across three of the top technology stories for this past year, showing the world how UX has come into its own. Looking at their backstories, we can derive critical lessons for the importance of our work and how to frame it in a global perspective. On the surface, this story was about a company using the inventions of another company without permission. Apple claimed–and the jury agreed–that Samsung violated some critical patents in the design of the iPhone. Samsung should’ve either paid Apple for the rights or come up with their own inventions. Yet, just below the surface, the trial’s key message was how desirable a great experience is and what a company will do to achieve it. Samsung might’ve come up with a great experience on their own, but borrowing from the Apple iPhone experience was too good to pass up. How good? The jury awarded Apple $1 billion. Ok, that’s pretty good. There were two key pieces of evidence that Apple introduced to the jury. The first was a timeline of Samsung’s products, both before and after the iPhone’s introduction. Before the introduction, Samsung’s phones looked like your standard feature phone, Blackberry, or Palm-like smartphone, with a hardware keyboard. After the introduction, all the phones suddenly looked like the black glass rectangles we’ve become familiar with. Samsung was showing some inventiveness in their designs before the iPhone made its debut. However, afterwards, it seems they felt they were about catching up to what Apple had made. They were trying to convince everyone that there really was only one way to design a quality phone. The jury didn’t buy it. 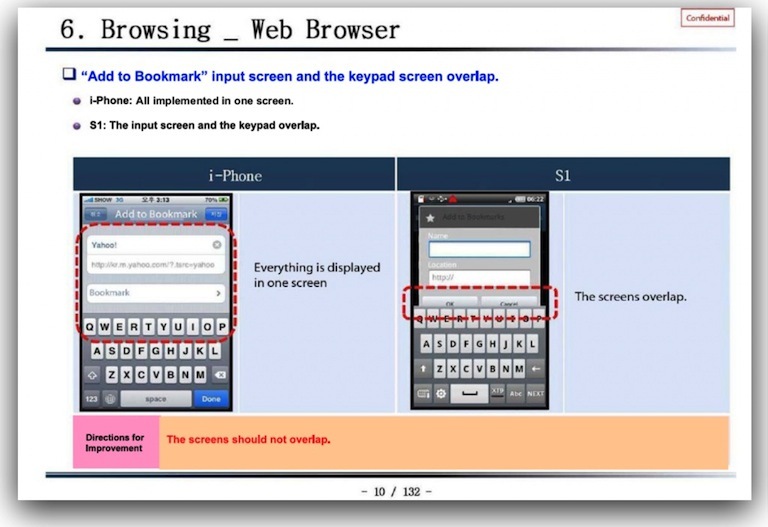 Samsung’s QA documentation comparing the iPhone on the left to Samsung’s product on the right. However, it was the second key piece of evidence that really showed the depth of Samsung’s intent. Apple presented a 132-page document created by Samsung’s Galaxy S1 QA team, documenting every difference between the S1 and the iPhone. It was the changes the team wanted Samsung’s engineers to make to the Galaxy and, in each of the 130 cases, they wanted to make it more like the iPhone. 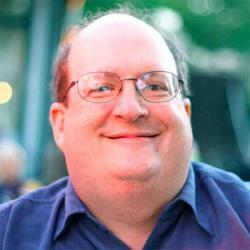 It’s here that we learn a ton about what goes into a great user experience. It’s fascinating how the Samsung QA team focused, like great QA teams do, on the little details that make a product frustrating. Each diagram shows how a certain S1 function works, pointing out exactly what needs to be done to make it better. The team held Apple’s design as the benchmark and the Galaxy S1 didn’t meet it. You can see the entire document here. This document is a treasure trove for UX teams everywhere. For a fun exercise, use the document to derive specific design principles. With each diagram, identify the principles that Apple followed that Samsung didn’t. To make the exercise more fun, talk about where your products follow those principles and where they fall short. The Samsung QA document shows just how important the little details are when it comes to creating a great experience. Each little detail, on its own, isn’t that significant. However, when you combine them together, it becomes the death of a thousand cuts. Another billion dollar UX lesson comes from Facebook’s sudden decision to acquire the company behind the popular photo application, Instagram. Sure, lots of companies get acquired for lots of reasons, but Instagram was a prize for Facebook because it had quickly gained a ton of users. Having just released its Android version, Instagram acquired 40 million new users in just 10 days. A few months before, Facebook had released its own photo app, Facebook Camera. However, Camera’s adoption was slower and its interface was clumsier for basic photo posting. Instagram was a smart buy for Facebook. Even before Facebook Camera, there were dozens of photo applications available for iOS and Android smartphones and tablets. Yet none had been as popular as Instagram. At first glance, the novelty of Instagram’s filters, which make new pictures feel like 70s polaroids, was the key feature. 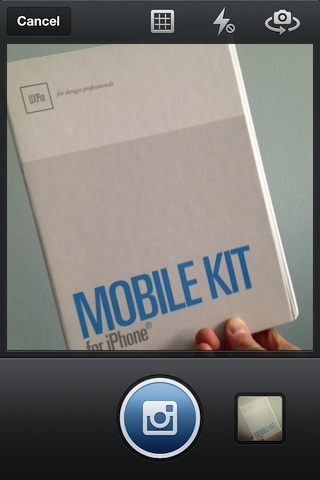 However, other camera apps, such as Path and Hipstamatic, also had filters, yet weren’t proving as popular. The reason for Instagram’s success was more subtle. It lay in the reduced flows for taking pictures and seeing the pictures of other Instagram users. The picture-taking flow made it quick and easy to snap a photo and share it on popular social networks like Twitter, Facebook, Flickr, and Tumblr. Quick photos that looked great became part of people’s social streams. The start-to-end flow of sharing an immediate photo was the fastest available. Their app took advantage of the new speed and multitasking capabilities of the phones to let people see images almost as quickly as they were posted. This created a sharing platform for photo discovery that surpassed everyone else, including Facebook. That’s why Facebook plopped a billion dollars of stock on the table. They wanted that streamlined user experience for their own. Now we know how much a super-fast UX is worth. The third lesson comes not from a UX success, but a UX failure. Apple wanted to get out from Google’s control and fee structure. 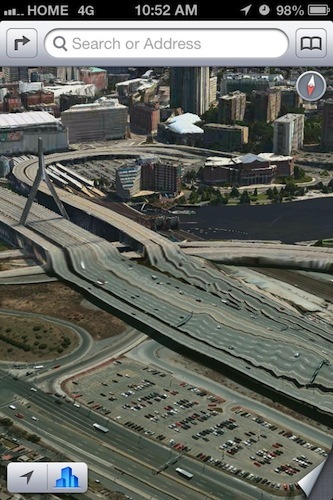 Apple decided to use their own newly acquired mapping capabilities in the just arriving iOS6. After all, how hard can it be to create a great mapping application? Turns out, it’s difficult and in ways you might not think. Apple did the right thing and invested heavily in the functionality of their new mapping app. In fact, feature-for-feature, it’s pretty much the best thing around. The new turn-by-turn direction system is really awesome. for the blind with a really cool sound-based cue system is nothing short of miraculous. Yet all that falls apart when the underlying contents quality isn’t up to par. As we’ve all heard, Apple’s iOS6 maps fell short in many places (pun intended), often mislocating important landmarks in the middle of lakes or sending people into the wrong neighborhood when looking for a nearby pharmacy. Sometimes you don’t notice how important something is until you no longer have it. We didn’t realize how great the quality of Google’s maps were until suddenly that quality wasn’t there. In many cases, that’s how user experience works. We’ll tolerate a poor rendition of it when we don’t know any better. However, once we’ve had great experiences to compare to, we suddenly notice the plethora of bad experiences we never attended to before. The big lesson from Apple’s iOS6 map problems is that quality of content needs to be assessed right alongside the functionality of our designs. A sudden reduction in content quality will cancel out all the good will we create with new, innovative features. Since it’s the time for predictions, I’ll go out on a pretty thick limb to suggest we’ll see more UX lessons from upcoming technology headlines. User experience is the driving force behind many important business decisions these days. We’ll see more billion dollar deals that emerge from great user experiences, and we’ll see more huge disasters emerge from substandard experiences. Taking stock in these is when we learn what’s becoming important to our stakeholders and how to avoid the mistakes of others. All this attention on user experience is a pretty good thing, I think. Published here on January 2, 2013.